A Wall Calendar Template in InDesign to Download, and it’s is Free! The wall calendar template sizes that are seen below will work with InDesign CS4 and above. A PDF comes with the InDesign file, so that you can see how printer’s marks and bleeds are to look in the PDF you send to Star Print Brokers for printing. Just click on a template size to download instantly. Our calendar printing is all beautiful, and have individual shrink wrapping. They come with a stiffening board and the cost is quite affordable. Print a wall calendar as a companion product with your print book. Books and calendars that sell together should look similar. Sometimes when printing is done by two different printers, you see color and saturation differences that you don’t want. We look for color reproduction as well as overall quality. Save up to 70 percent on book printing. 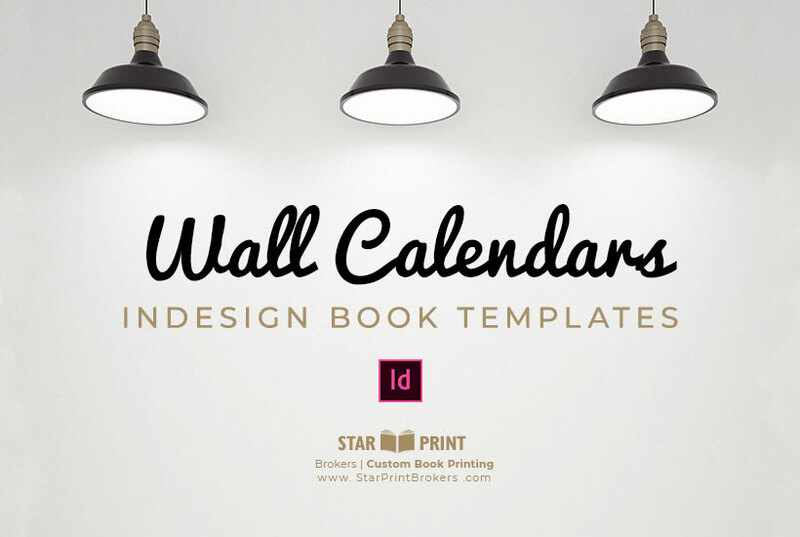 Be sure to request a quote for a wall calendar when you request a book printing quote. ©2014 Star Print Brokers, Inc. Choose any wall calendar template. You can modify it in InDesign. We are not limiting you to any one size of a wall calendar template. Self-publishers can print custom sizes too. At Star Print Brokers, you have more choices than most anywhere else. Everything we do is custom. We stand behind our books and calendars. This is not print on-demand printing. It is so much better! Self-publishers can now have custom made books and calendars with many options, and at a reasonable cost. Contact us today, or request a book printing quote or book design quote. We are happy to help you with book printing, book design, or both, and talk to us about the vision you have for your book. Enjoy your calendar template!